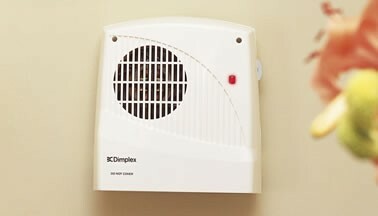 Dimplex FX20VL Fan Heater - John Cribb & Sons Ltd, UK Electrical Distributors, Dorset, Hampshire, Wiltshire, Somerset & the Isle of Wight. Compact space saving wall mounted fan heater. Designed for low level mounting. Adjustable energy saving thermostat. Choice of heat output on installation. With their compact design, FX downflow fan heaters are the popular choice for heating bathrooms and en suites as well as kitchens. The powerful 2kW output ensures a fast warm up, although 1kW output is selectable on installation for smaller rooms. All models have visual on/off indicator, full safety protection and are simple to install. Designed for low level mounting.